You can change the way your blog appears and functions through Themes. When you set up a new blog it has the theme TwentyFourteen applied as standard. Some themes are suitable for different purposes. If you are switching themes you will lose any widgets you have set up. You can save the content of these widgets by dragging them to the Inactive Widgets section of the Widgets area of the dashboard before you change theme. You will also have to place you menus after switching theme. your menus will be the same but they will not appear on the blog until you se their location. 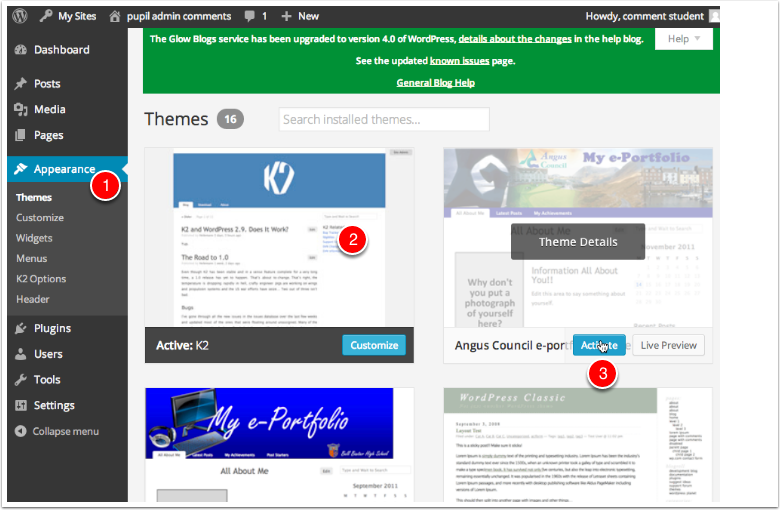 Themes are managed from the Theme page of the Appearance section of the dashboard . This page shows the current theme  and Thumbnails of all of the other themes. You can Preview each theme and activate them from the links under each thumbnail. clicking on the thumbnail will preview that theme. Jetpack – Examples using the Jetpack Plugin The JetPack Blog uses the TwentyFifteen theme. Make Theme The Make them supports a page builder when you select that from the template chooser for a page you can add various sections to your page: banners, column sections and galleries. TwentySeventeen – An Example Glow Blog The TwentySeventeen theme supports Video headers, multiple sections on the front page as well as widgets, navigation and social menus, a logo, and more.